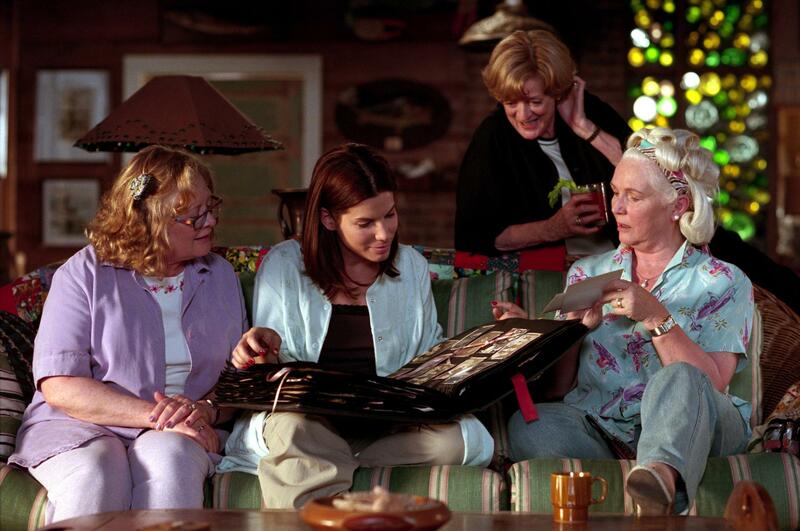 Sixteen years ago, on June 2, 2002, The New York Times Editor Dana Kennedy published an article titled, “An Impatient Sisterhood.” Addressing Hollywood’s systemic exclusion of female film directors, the article highlighted the work of director Callie Khouri, an Academy Award winner for Thelma and Louise who was turned down repeatedly for 10 years before directing the soon-to-be-released The Divine Secrets of the Ya-Ya Sisterhood. "In seeking explanations for the career frustrations of prominent female directors, why not try looking closer to home? Who reviews films, on staff, for The New York Times? Three men. Who reviews films for The New Yorker? Two men. When the National Society of Film Critics published its recent book of 100 'essential films,' how many of the contributors were women? Four out of 41. I'm willing to bet that if more major publications hired more female film critics, then more films by women (which, surprise, surprise, are often films about women) would get the kind of critical buzz that leads to box office clout." Why is it so important to have female film critics? There are hundreds of films by women released every year with a large percentage passing the Bechdel-Wallace Test. Yet, these films are continuously excluded from both awards consideration and the top of the box office. A recent study by the University of Southern California Annenberg Inclusion Initiative concluded that reviewers of the 100 top-grossing films on Rotten Tomatoes in 2017 are overwhelmingly white and male. According to the report, 83 percent of the critics are white males. 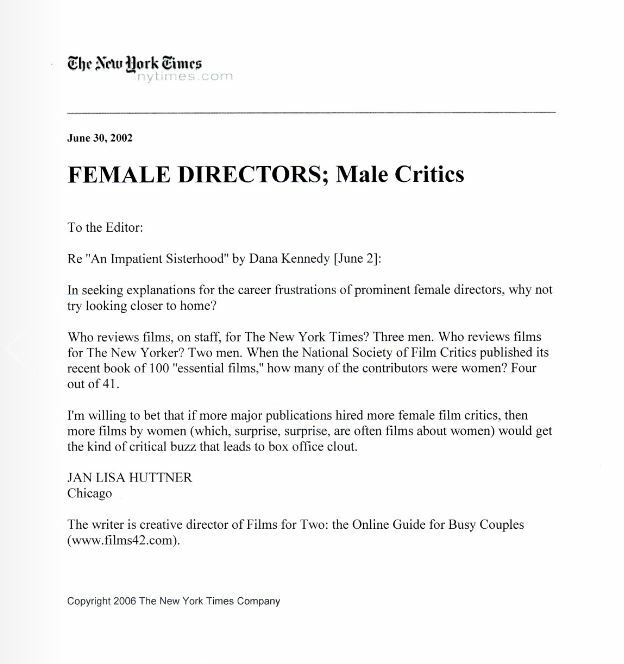 FF2 Media, coinciding with the anniversary of The New York Times article, is now celebrating its 16th year as a female-run company dedicated to reviewing every film released by a women writer and/or director that opens in NYC each week. Reviewing films of all genres and in all languages, from summer blockbusters to foreign indies to film festivals and private screenings, we aim to build the bridge between female filmmakers and movie-loving women in the audience. 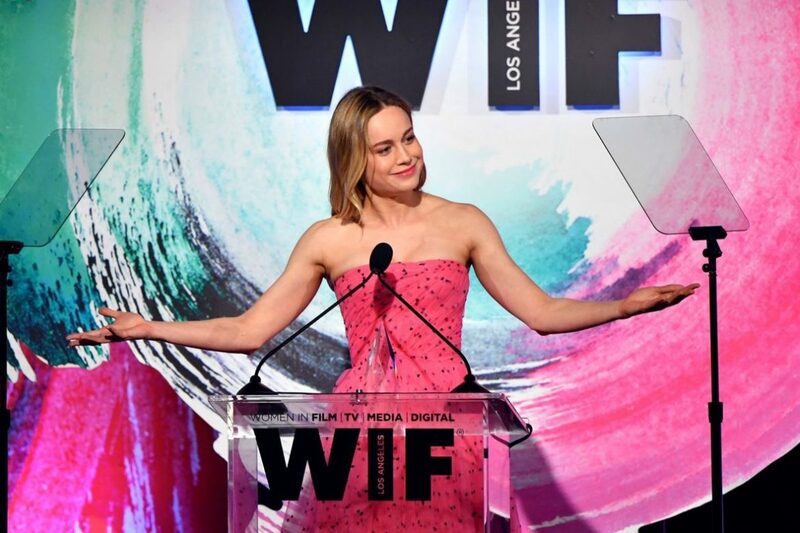 Actress Brie Larson addressed the lack of diversity in film criticism when accepting the Crystal Award for Excellence in Film at the 2018 Crystal + Lucy Awards, saying she didn't need "a white dude to tell me what didn't work for him about A Wrinkle in Time." Acknowledging that the film wasn’t made for him, Larson continued, “I want to know what that film meant to women of color, to biracial women, to teen women of color, to teens that are biracial. And for the third time, I don't hate white dudes. These are just facts, these are not my feelings." A Wrinkle in Time director Ava DuVernay responded to Larson’s championing of her film via Twitter, writing: @BrieLarson is a warrior. Much respect. FF2 Media applauds Larsons call to change: "If you make a movie that is a love letter to women of color, there is an insanely low chance a woman of color will have the chance to see your movie and review your movie. We need to be conscious of our bias and make sure that everyone is in the room." As the saying goes: “Women hold up half the sky.” We don’t need ALL the stories, but we do need some!